Celebrating a win at the Blackjack table at the Aria Resort, my friend and I walked next door to the Mandarin Oriental Las Vegas to enjoy lunch before flying back to Los Angeles. 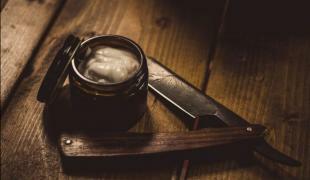 The first pleasing experience we noticed upon entering the resort was an intoxicating smell of citrus and tea, instead of the typical cigarette smoke you encounter when entering a Las Vegas casino. The Mandarin Oriental is one of the newer properties on the Las Vegas Strip without a gaming floor. Older hotels in Las Vegas just don't have the updated air purifiers like the newer ones and the Mandarin Oriental’s signature Mandarin Blossom tea scent is filtered through the corridors and guestroom floors, creating a fresh and welcoming atmosphere. 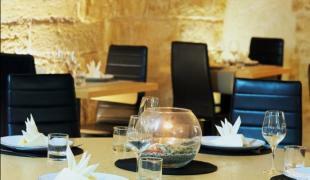 Offering a Zen-like experience, the interior of the hotel's MOzen Bistro offers colors of gold, cream and Dijon mustard. Running through the soothing carpet is a swirl of black, that seems to maintain a Vegas flair. The center of the dining room has a beautiful infinity light fixture offering a touch of sparkle into the room. We were led to a table with comfortable upholstered gold chairs next to floor-to-ceiling windows with sweeping views of the grand circular entrance of the Mandarin Oriental, Crystals Shopping Center and big Hollywood neon sign of Planet Hollywood across the street. The staff at the Mandarin Oriental, go above and beyond guests expectations in atmosphere, food and service. Looking over the menu, it offers tastes from around the world. The Executive Chef at MOzen Bistro is Katsunori Kawaguchi a.k.a. Chef Kats. Our server, Juan, told us that Chef Kats is a celebrity on the Strip. 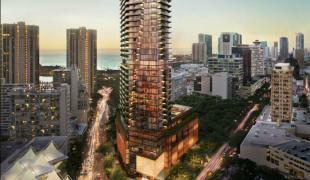 "Guests staying at the Nobu hotel, come to MOzen Bistro to enjoy sushi and sashimi," Juan confided. "Other chefs from other hotels come here too to eat a meal and talk with Chef Kats." Originally from Osaka, Japan, Chef Kats moved to Hawaii to open a restaurant. Years later he worked at Ceasar's Palace for a few years until the Mandarin Oriental lured him over when they were planning to open. 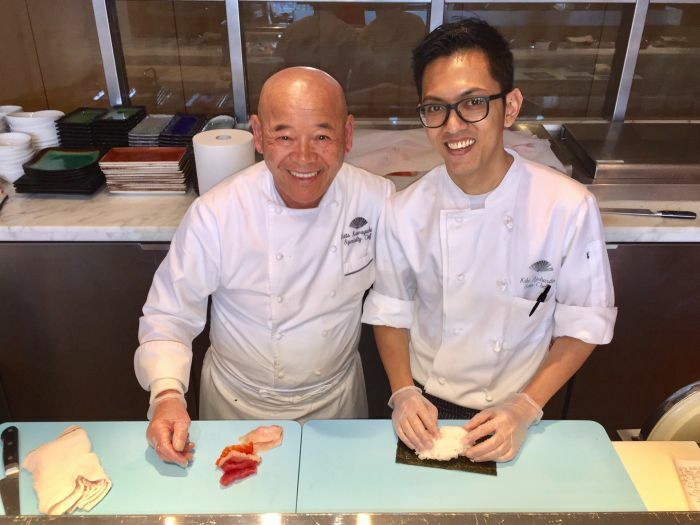 The restaurant built an open sushi bar for guests to observe Chef Kats perform his magic. 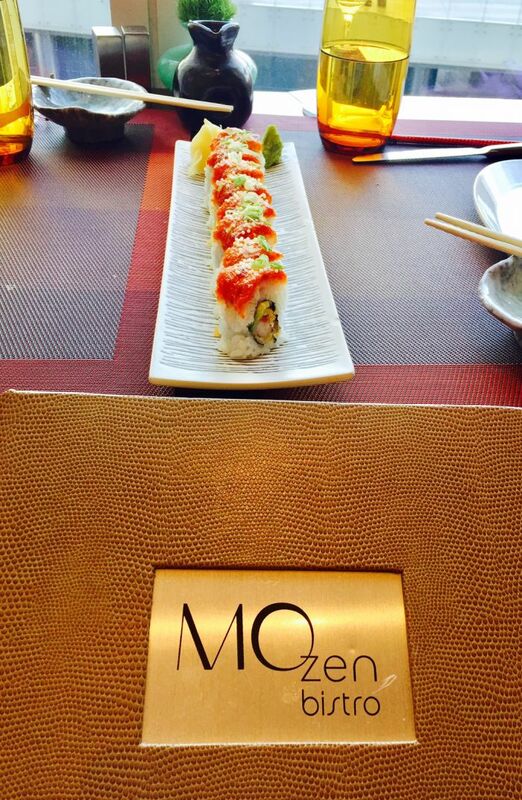 Be sure to order his elegant shrimp tempura roll. 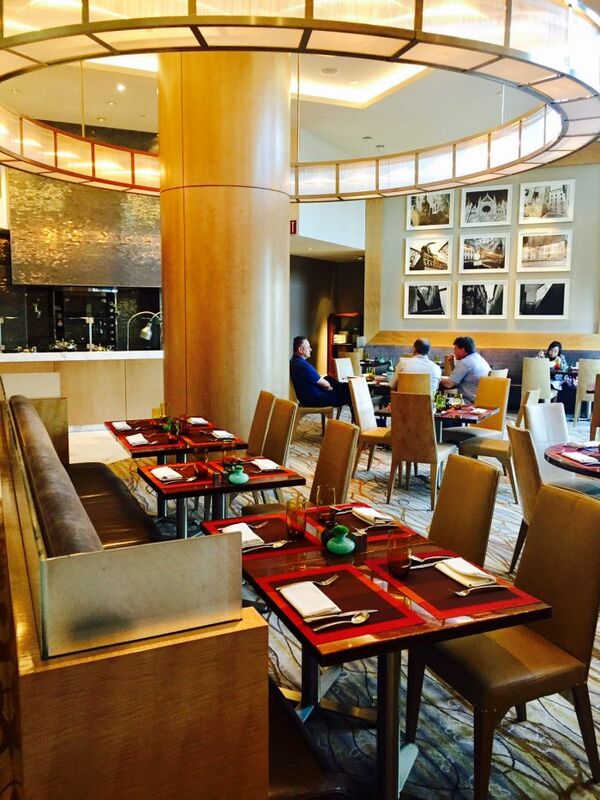 Besides Asian favorites, the menu features American and Indian classics cooked in Tandoori ovens in the kitchen. Indian dishes on the menu include the chicken Tikka wrap and butter chicken with fresh naan. During lunch they offer a roasted chicken Tikka in creamy Indian curry with steamed basmati rice, naan and lentils. Another favorite lunch menu item is the Thai beef salad made with rib-eye, and dressed with a sweet and spicy balance of chile paste, sweet sesame and soy dressing. We enjoyed glasses of Domaine du Deffends, Rose'd'une Nuit, Coteaux en Provence while eating a Thai Green Curry salad with thinly sliced, long strips of cucumber assembled into a beautiful circular salad. 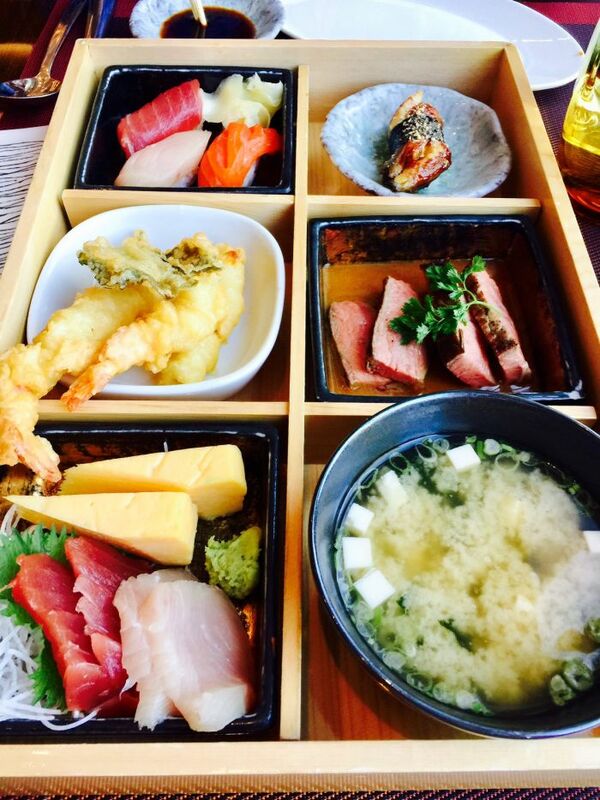 A fun dish to order is the Bento Box with a bowl of miso soup, and six compartments offering bite-sized pieces of barbeque eel, fatty tuna belly toro, big eye tuna, dense tamagoyaki and tempura vegetables. 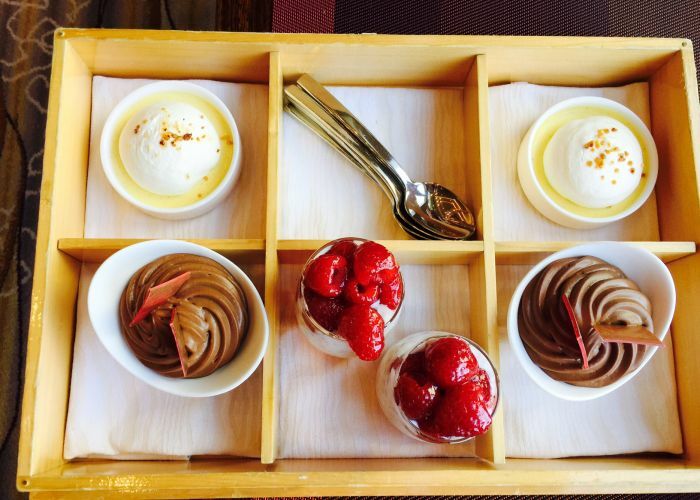 Dessert is delivered to each table in a Bento Box with an exquisite lemony crème brulée, chocolate mousse, and a berries and cream in a cup to satisfy anyone's sweet tooth. 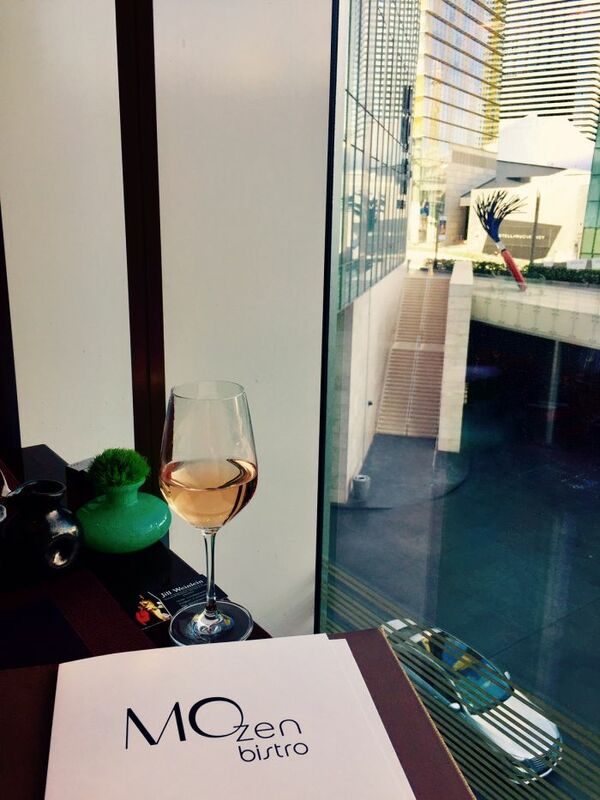 A meal at the Mandarin Oriental leaves a lasting impression in a city where everyone wants to leave as a winner. Elegant lunch at MOzen Bistro inside the Mandarin Oriental.